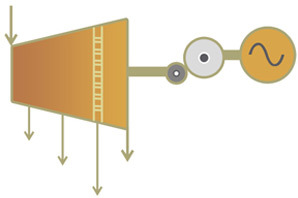 With the process header connected directly to the exhaust steam, the straight back-pressure turbine aims to maximise the available steam in each of the turbine stages. 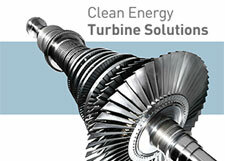 As such, it is the most commonly-used turbine on the market. By extracting the steam at specified intervals throughout the turbine process, this model offers flexibility for seasonal changes. 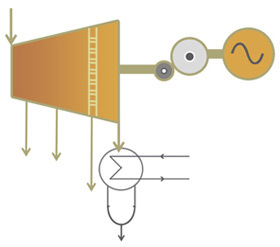 The entire turbine operates via the use of a closed loop feedback system, whereby the pressure at the output is measured. 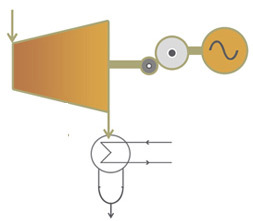 Based upon this reading, a controlled amount of steam is allowed to escape the mechanism by increasing or decreasing the valve aperture, thus regulating the flow inside the turbine. This type of device is most appropriate in situations where steam pressure is of paramount concern, such as low-pressure (LP) heaters or de-aerators. In certain cases, a permanent port is installed and a constant stream of high-pressurised steam is let from the turbine – this port is secondary to the controlled extraction and only serves to reduce overall pressure. 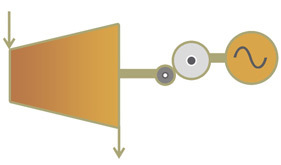 Like controlled extraction back-pressure turbines, these devices have a nozzle or tap installed on the turbine – but unlike them, the aperture cannot be increased or decreased, meaning that a steady stream of heat is constantly withdrawn but cannot be controlled. This type of turbine is most appropriate for applications wherein an unchanging temperature and amount of steam flow is required. District heating applications often utilise these turbines. In this turbine, all of the heat energy generated by the steam is captured and converted into torque, otherwise known as mechanical energy. This is then used to generate power – since this process is so effective for power production, straight condensing machines are most commonly found in captive power plants (CPPs), independent power producers (IPPs) or other sites where power generation is the primary objective. 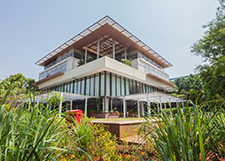 They are commonly used in conjunction with bleed systems to achieve de-aeration. 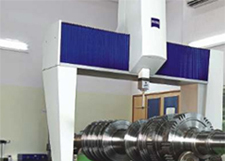 This is one of the most complex turbine systems, allowing it to be applied to a wide variety of uses. By feeding a constant stream of pressure through the turbine and extracting specifiable amounts at various stages, the turbine allows for seasonal variations. 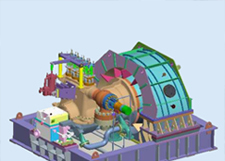 As the model offering maximum efficiency, controlled condensing type turbines are commonly used in co-generation power plants. Again, much like the controlled extraction condensing turbine, the steam path here is fitted with a nozzle, but unlike that turbine, the aperture cannot be altered and the flow of steam which is extracted cannot be modified. It is most commonly used in independent power plants (IPPs), captive power plants (CPPs) and co-generation power plants.